What is drag racing all about? At its heart, drag racing has a simple premise – go when the green light comes on and then beat the other vehicle to the finish line. In reality, drag racing is a complex and very technical sport, with a dizzying array of jargon. Practice (also called time trials or grudge racing): This is where vehicles race each other in no particular order. The result of the race doesn’t matter for the official meeting results but often has ‘bragging rights’ for the drivers, which is why it is sometimes called grudge racing. There is no handicap in the starting system used for practice. Often two vehicles of different performance levels will race and one will finish well before the other one. Towards the end of the meeting, practice is used to fill the spaces between the rounds of elimination. Qualifying: Similar to practice as there is no handicap in the start system and vehicles race each other in no particular order. Unlike practice, qualifying is always grouped by vehicle category, and the results do matter! The elimination seedings are generated from qualifying, and racers try to qualify number one, as this entitles them to the first scheduled bye (if any). Most lower categories (Super Street, Modified Bike, Super Sedan, Modified, and Junior Dragster) qualify by the best non-red reaction time. Most other categories qualify by the quickest ET. Some elimination categories are only open to a limited number of cars, so qualifying is used to determine which cars are in the field. During eliminations, the non-qualifiers will run as practice, or they may be transferred to a lower category field. Qualifying is usually run on Saturday. Eliminations: This is the business end of racing. Eliminations are usually held on Sunday and are run ‘Tournament style’. The highest seeded vehicle will race the lowest and the loser of each pairing is eliminated and is finished racing – there is no room for mistakes. There are several rounds of racing, culminating in the final. The number of rounds is dictated by the number of entrants in the field. If there is time the losers may participate in grudge racing later in the day. Do you have eftpos at the gate? No. You’ll need to have cash to get in the gate. Racing is usually underway by 10am on Saturday, and 9am on Sunday. What time do the gates open to the public? The public gates open at 8am. Racing normally finishes about 5pm on Saturday. The finals are usually run about 3.30pm on Sunday. Yes. Your own food and drink is allowed. Absolutely no alcohol to be consumed in the pits until all racing is completed for the day. Unfortunately we can not predict the weather. We’ll do our best to update any schedule changes due to weather on the day via our Facebook page. You can also check out one of the many local Masterton weather reports. It depends how far through the meeting we’ve gone. Rain often clears up, and we will resume racing after the track dries but this can often take up to 30 minutes after the rain stops. If the day’s racing is called off, we will announce this over the speakers. No. Camping facilities are available for racers and crew only. What do all the lights on the ‘Christmas Tree’ mean? The red light comes on either 1) if the car/bike leaves the start line before the green light is on, or 2) if there is no car in that lane. Why do they do a burnout? A burnout has two specific purposes. Firstly, it heats the tyre rubber making it softer and stickier, giving more traction. Secondly for competition vehicles that have slicks it deposits a thin layer of hot sticky rubber on the race track surface. When the car/bike backs up, the crew attempt to get the racer to line the car/bike up so that the hot sticky tyres are directly on the thin layer of hot sticky rubber they have just laid, to give the maximum traction at the start. The job of the person at the front of the car is to direct the racer to back the vehicle in the freshly laid rubber, when they wave they are signaling the racer to steer so that this happens. How do I know who has won the race? There is a win light for each lane on the large number boards at the finish line. The light for the winning lane is lit for a few seconds before the next race is set up in the timing system. Additionally, the lights on the Christmas tree flash for the winning lane, but sometimes this is hard to see unless you are quite a way down the track so can see both sides of the Christmas tree. Why do the cars seem so mismatched at the finish line? During qualifying (usually all racing on Saturday is “qualifying”) the cars are not racing each other, they are trying to get their best elapsed time, or best reaction (depending on the category) to qualify as high as they can. This may mean that the racing appears to be mismatched and one car will often be much quicker than the other one. When actual eliminations start, handicapping is used and the cars are often very close at the finish line. Why do the cars leave the start line at different times? To ensure both racers have a fair chance of winning during eliminations, most racing uses a handicap to give the slower car/bike a head start. There are two types of handicapping. In index racing, the handicap is chosen for you by the national governing body. The index the same for all vehicles in the same class, and is usually a bit lower (called “softer”) than the current national record for the class. If the national record is broken, then the index for that class is reset for the next race meeting, but the car/bike that broke the national record will get an advantage for the rest of the race meeting because they can go much quicker than their index. Unlike DYO, there is no “breakout” for index racing so if you can go a little bit quicker than the index without breaking the national record, you should be able to win your races, all else being equal! A category or bracket is a group of vehicles that race together to produce one winner. Some categories are predetermined by the national governing body for example “Super Sedan” A category can have cars that are classified (have a class) or that are specially build for the category. Specially built cars also have an identification system but this is much simpler. For super sedan there is SS/A for v8 cars, SS/B for six cylinder cars, and SS/C for four cylinder cars. Categories pre-determined by the NZDRA are Junior Dragster (for dragsters and Funny Cars, drivers between 7 – 18 years old), Super Street (for registered and warranted cars slower than 11.00 seconds), Modified (for Altereds, Dragsters and Funny Cars), Super Sedan (for street appearing cars) Supercharged Outlaws (for supercharged dragsters, altereds, funny cars, and cars) and Modified Bike (for street appearing bikes). 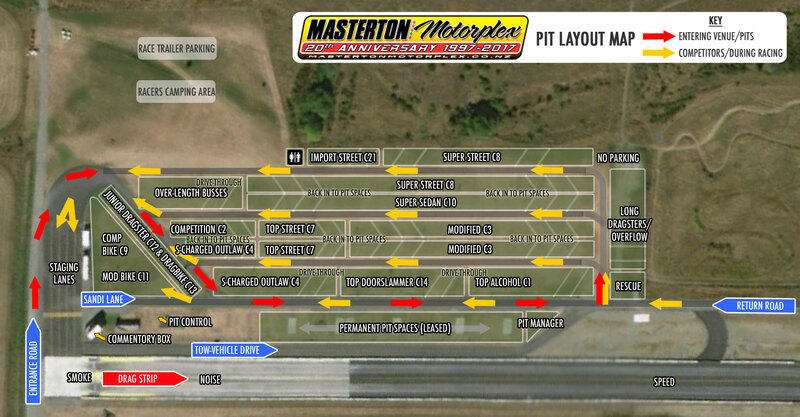 For some race meetings, Masterton Motorplex will create its own categories. For example, we often have “Import Street” for registered/warranted Japanese based street cars), Dragstalgia Hot Rod for hot rods older than 1948, Dragstalgia Muscle Car for muscle cars from 1948 to 1972. All categories are assigned a number so the computer system can manage the racing, which is why you will sometimes hear phrases such as “C8” (which is Super Street). A list of the categories being run at the meeting is always attached to the pit control office (in the pits, just behind the VIP stand). Why do people say ‘fastest’ and ‘quickest’ like they mean different things? The sole purpose of drag racing is to get to the finish line before the other racer (without breaking out). This is all about acceleration – the “G-force”. The time taken to get from the start line to the finish line is called the “elapsed time” or “ET”, and the timing system calculates this to six decimal places! Because the ET is about time, not speed, the ET is how “quick” the car/bike goes and the winner is the “quickest”. Although speed is not used to determine the outcome of the race, we also measure the speed the racer is going at the finish line. As drag racing is an American sport, this is usually in miles per hour, and racers have speed personal bests as well as ET personal bests. Speed is how “fast” the racer is going, and so is different from how “quick” (which is the ET). Most street cars/bikes have ETs in the range of 11.00 to 15.00 seconds and speeds in the range of 90 mph (145 km/h) to 120 mph (195 km/h). Only the top cars can go quicker than 7 seconds and faster than 200 mph as this takes over 2000 horsepower (1500 kW). Reaction time is the time (in thousandths of a second) between the green light coming on and the front of the front wheel going past the start line. A “perfect” reaction time is 0.000, and anything between 0.000 and 0.050 is very good. Reaction time is important because the race doesn’t start until the vehicle has left the start line. If the reaction time is poor (higher than 0.150) then the vehicle in the other lane is already racing and moving down the track before the vehicle with the poor reaction time has even left the start line! Because it takes time for the racer’s body to react to the green light, then even more time for the vehicle to move past the start line, racers usually start when they see the bottom (third) yellow light. This means the car/bike actually starts to move before the green light comes on (but does not go past the start line). If the front of the front wheel goes past the start line before the green light comes on, then the racer is disqualified, and the red light comes on. This is called “popping a cherry” or “red-lighting”. What is a ‘holeshot win’, ‘driving around’ and a ‘win at both ends’? What is ‘gas’, ‘avgas’, ‘C16’, ‘NOS’, ‘alcohol’, ‘Nitro and ‘fuel’? These are all types of fuel used to power the cars/bikes.